Family: Accipitridae. 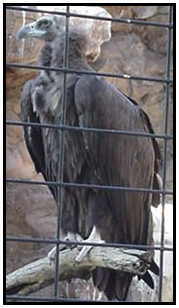 (Old World vulture). 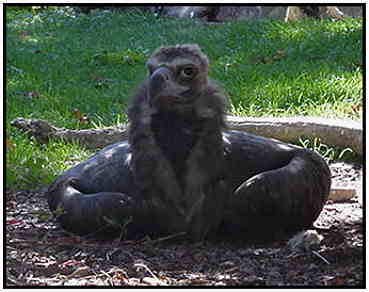 Common Names: Cinereous Vulture, European Black Vulture, Mallorca Black Vulture, Mönchsgeier (Germany). Habitat destruction - Mediterranean hardwood forests are being logged at a high rate and this bird requires those tress for nesting in. It will not nest on the ground or cliffs so habitat destruction is a direct threat to the species. Reduction of food supplies - Farmers no longer leave carcasses to rot, but bury them for reasons of hygiene and to prevent possible disease affecting other stock. This has led to a severe shortage of food. Use of poisons - Carcasses are often poisoned, the idea being this will control wolves, foxes, and jackals. Unfortunately, the same poisons will kill any vultures which feed from the corpses. Illegal hunting - This still frequently occurs despite protection by law. Disturbance at nest sites - Disturbed birds will often leave, never returning. Rescue & Recovery: Captive breeding. As of 1999 rescue schemes had seen around 20 of these birds returned to the areas near Mallorca and the Cevenne. Four of these pairs have been observed as breeding. Special note: The bird shown behind bars on this page was spotted in an Asian zoo. Unfortunately, zoos in Asia are frequently sub-standard (as was this one) and this bird was seen to be bleeding from around the wing area. There is no reason to expect it will be used in a productive breeding programme. Geographical Range: Mongolia, the Urals, central Asia from Turkey to Afghanistan. Odd pairs in Cyprus, Sardinia and Crete. Small populations in Yugoslavia, the Crimea and Greece. Larger numbers found in Spain and on Majorca. Though the range of this bird is very wide, it is also very fragmented and there's nowhere that the bird could be termed numerous. Habitat: Wooded mountainous areas, travelling to the lowlands to seek food. Has been sighted on Mt. Everest at heights of up to 7,000 metres. Physical Characteristics: This bird of about 40" long is an overall dark brown. On the head and neck bluish grey skin is covered with blackish down which, in juveniles, is much thicker and darker. Like most vultures this is not a vocal bird, but it does emit occasional croaks, mews and hisses during feeding or the breeding season. 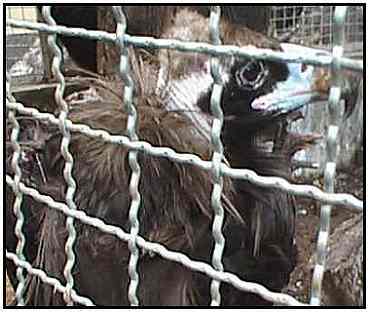 Food: The Cinereous Vulture feeds almost exclusively on carrion though it will occasionally attack small injured animals and even tortoises. When feeding around a carcass it holds dominance over most other species, though it will tolerate their presence. In the wild, the carcasses of domestic sheep and goats now provide most of its diet. Reproduction: Like many other raptors this birds lives in a permanent state of monogamy and they may pair up long before reaching sexual maturity in their fifth or sixth year. Builds a large and rather crude nest in a tree, with the large branches being collected by the male and the assembly being done by the female. She then lays a single egg (white with brownish spots) which is incubated by both parents for 52-55 days. Parents jointly feed the young with regurgitated food. During the first 30-60 days the plumage grows in and after 100 days the youngster is ready to take its first flight. Young birds remain in the nest for a further six weeks after this time.